Looking for an Amish-made barn for your home? Outdoor buildings made by Amish include a wide range of structures, including barns, sheds, and garages. Amish in Pennsylvania make an extensive variety of barns for a consumer market, including storage barns, mini barns, and equine barns. Amish barn retailers can be found in over 2 dozen locations across the state, including in the vicinity of Pennsylvania cities like Pittsburgh, Harrisburg, Lancaster, Philadelphia, Reading, Scranton, Erie, and others. Country Barns of Pittsburgh features Amish-crafted outdoor structures including barns, gazebos, playhouses, play sets and lawn furniture. Amish barns come in different models such as Hartford, Boston, Mystic and Delaware. Gambrel or Saltbox roofs are among options to choose from. Amish Yard is a Pittsburgh-area supplier for Amish made products. Amish Dutch model barns come in a range of options including siding, roofing, exterior, interior, paint colors and more. All American Storage Buildings has been a family owned and operated business since 2000. They are a Pittsburgh area supplier for Amish-built outdoor structure including mini-barns, Dutch barns and 6′ wall barns. Meadow Lark Structures is an Erie-area location for Amish-built outdoor buildings such as mini barns, cottages, Quaker sheds, Hi-Wall barns and garages. Mini barns and Hi-Wall Barns come in economy, vinyl and deluxe options and can be use for different purpose such as tool storage or garden equipment storage. Meadow Lark has two Erie-area building display locations. Pine Creek Structures is one of the biggest Amish-crafted outdoor buildings manufacturers with over 20 Pennsylvania locations. Erie store locations features different storage structures including Madison mini-barns, cottages, carriage houses, sheds, steel carports, Dutch barn workshops and more. PA Dutch Builders features a broad selection of products made by a skilled Amish crew. Some styles of Amish-built barns include horse barns with carriage storage, Stall barns, single wide with two story barns, Williamsburg, Jerry, Alpaca barn models and much more. PA Dutch Builders is located in the Ephrata area in north Lancaster County, PA.
Amish Marketplace is an Amish outdoor structure manufacturer, located one hour east of Harrisburg. They offer Amish-built sheds, mini-barns, garages and specialty sheds. A variety of vinyl siding and shingle color options available. Amish Marketplace has store locations in Reading, Nazareth and Malvern. Glick Wood Works is a Lancaster area supplier for hand-built mini-barns. Precise Buildings offers structures made by an Amish and Mennonite crew. They specialize in outdoor structure such as barns, pole buildings, garages, run-in sheds and all kind of interior and exterior works. Amish-built barns come in a range of sizes, styles and options. Precise Buildings is located half an hour east of Lancaster. Equine Barns offers a range of Amish built portable buildings for different uses, including horse barns handcrafted by skilled Amish contractors. Each product can be customized. Lapp Structures is an Amish outdoor structure manufacturer in the Lancaster area. They offer a range of outdoor structures including Amish hand-built horse barns, mini barns and high-wall barns. Sheds Unlimited is an Amish portable building supplier located in eastern Lancaster County, PA. They offer wooden and vinyl Economy barns along with other buildings. Keystone Barns carries custom-built barns and modular buildings. Some of the structure models include horse barns, custom barns, pole barns, oak frame barns. Also carries barn door hardware. Sylvan Stoltzfus Builders specializes in construction and renovation of barns, garages and residential structures. They provide service in Connecticut, Delaware, Maryland, New York, Pennsylvania, and Virginia. Amish and non-Amish crews available. Archery Construction offers horse barns, riding arenas and other kinds of pole buildings. Most of the crew is Amish from the Lancaster County area. Their structures feature a broad choice of options including barn doors, cupolas, weather vanes and perma-column foundations. Backyard Creations of Lancaster features a vast selection of Amish-built outdoor structures including mini-barns that come standard with duratemp wood siding, wood trim, and in various colors. Each structure can be customized to any specifications by adding extra vinyl exterior, windows, or shelving. Amish hand-crafted horse barns available. Some of the barn models including L-shaped, modular, low profile, back yard horse barns, steel frame, high profile, monitor horse barns and more. Business employs 15-20 skilled Amish builders. Lancaster County Barns carries a broad choice of outdoor structures hand-made by skilled Amish contractors. Choice of horse barns includes the board and batten hay or tractor barn, standard T-11 siding, Victorian model, board and batten with overhang, metal siding barns, and more. Sunhill Barns is Amish owned, operated by Samuel Stoltfus and his brother, and has been in business for over 15 years. Amish-built structures including horse barns, pole barns, run-in sheds, storage barns and more. 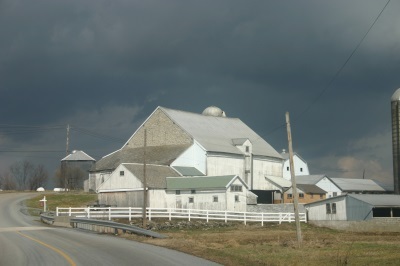 Sun Hill Metal Barns is located half an hour north of Lancaster city. Groffdale Barns specializes in modular barns, shed row barns, post and beam bank barns and barn accessories. They provide an extensive choice of styles and barn options. Each building is Amish-handcrafted and can be customized to any needs. Discount Structures is a Philadelphia supplier for Amish made outdoor structures. They have been a family-owned and operated business for over 30 years. Discount Structures specializes in quality built outdoor items using the expertise of Amish craftsmen from Lancaster County. Portable horse buildings such as stall barns, storage barns and larger barns available with a wide range of options. G & B Sheds has been in business for over 25 years. They offer a variety of quality built outdoor structures including barns. Amish made high barns and mini barns come in a range of options. This store has 3 different locations. Limerick store is located less than a one hour drive northwest of Philadelphia. Woodframe Homes provides Amish-built structures including pole barns, cabins, garages, sheds, and lawn furniture. Each structure can be customized. Please confirm hours of operation of Amish barn sellers before traveling long distances; locations and hours can change. Amish-owned businesses are closed on Sundays, though non-Amish barn businesses may be open. Not responsible for any changes to the above information. With dozens of settlements, Amish have thrived in the Keystone State, maintaining a continuous presence in the state since the 1700s. While windmills and dairy barns remain a part of the Pennsylvania Amish landscape, recent generations have trended towards small business activity as a means of making a living. Small scale Amish shops can be found in communities across the state, including manufacturers of barns and other storage structures. To find an Amish-made barn, many prefer to shop via a retailer such as those listed above. Some also seek Amish barns direct from the maker. And since some Amish sell direct to the public (though some sell exclusively on a wholesale level), this can be a viable alternative for some. A few of the larger Amish settlements in Pennsylvania are listed below. For those searching for an Amish barn business, the communities below are some of the most prominent in their respective geographical areas in the state. Read more on the Amish in PA.
West PA- Indiana County: The Amish community in Indiana County is one of the state’s largest, with over 2500 Amish residents. Central PA- Big Valley (Miffling County): The Amish settlement enveloped within 30-mile long Big Valley is one of the country’s most diverse, with 3 distinct Amish groups found here. Numerous manufacturing businesses are operated by Amish in the valley. East PA- Lancaster County: Of all Amish communities, the best known and one of the two largest. In the Lancaster County Amish community you’ll find numerous Amish structure companies, including barn manufacturers. I am looking to hire for builders to build me a 2 story barn size-20 feet wide x 12 feet long and 10 feet high, with a way to put hay up on upper area, with 5 stalls for birthing and still have enough room to move around in and for storage, on a concrete floor for easy cleaning. I would like a price, please. Thank you for your time.